The rise of graph-structured data such as social networks, regulatory networks, citation graphs, and functional brain networks, in combination with resounding success of deep learning in various applications, has brought the interest in generalizing deep learning models to non-Euclidean domains. 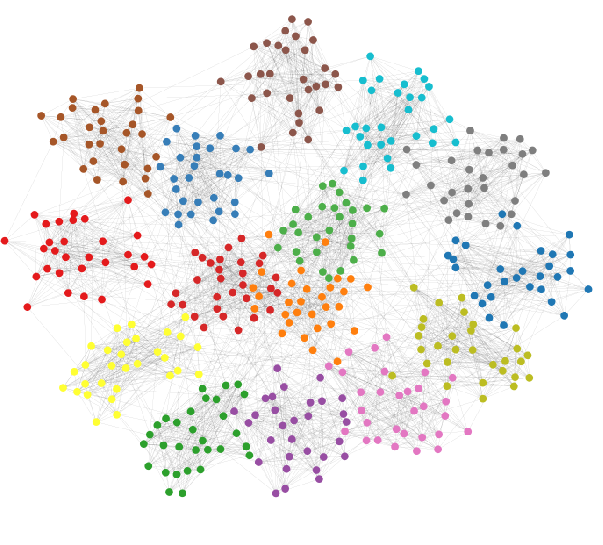 Considering the complicated and diversified topology structures of real-world networks, it is highly possible that the mapping between the original network and the community membership space contains rather complex hierarchical information, which cannot be interpreted by classic shallow NMF-based approaches. However, since previous GCN models have primarily focused on unsigned networks (or graphs consisting of only positive links), it is unclear how they could be applied to signed networks due to the challenges presented by negative links. We investigate an unsupervised generative approach for network embedding. While previous network embedding methods primarily preserve the microscopic structure, such as the first- and second-order proximities of nodes, the mesoscopic community structure, which is one of the most prominent feature of networks, is largely ignored. NMF is a useful tool for many applications in different domains such as topic modeling in text mining, background separation in video analysis, and community detection in social networks. Attributed network embedding aims to learn low-dimensional vector representations for nodes in a network, where each node contains rich attributes/features describing node content. These results introduce both a theoretically principled approach to evaluate over and underfitting in models of network community structure and a realistic benchmark by which new methods may be evaluated and compared. In this paper, we propose CommunityGAN, a novel community detection framework that jointly solves overlapping community detection and graph representation learning. In this paper, we propose a technique for time series clustering using community detection in complex networks.